Even an old dump truck deserves a second chance. It’s a sunny morning on Merryhilll Farm and everyone has a job to do, including Bee-Bee the Backhoe and Trundle the Tractor. But one old truck is no longer working; Dumpy lies rusted and broken in the long grass. Charlie and his grandfather decide to fix him up in time to help with the building of a new barn. 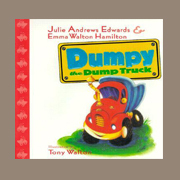 This delightful tale of loyalty and teamwork, the first in a series about the trucks and tractors that work on and around Merryhill Farm, will have children cheering Dumpy on as he is transformed from a broken-down heap into a gaily-painted, indispensable, and beloved truck.